How would you like to add polling to images and videos you post on Instagram? 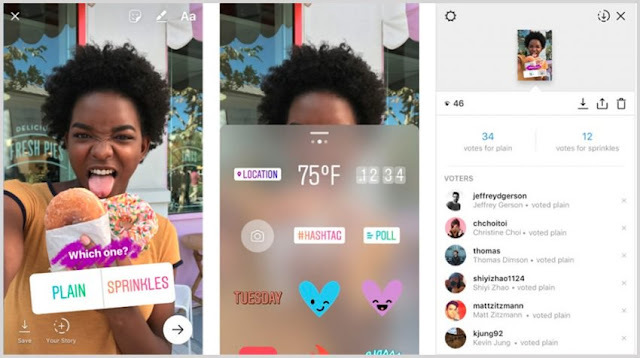 Instagram just announced the availability of Polls, a new interactive sticker that lets you add polls to your Stories. As part of Instagram Stories, you can now place a Poll sticker on an image or video. You then write your questions and give your audience a choice for the poll (black or white, tall or short, pizza or burgers, etc. ): it couldn’t be easier. If you are a small business owner using Instagram’s Stories as part of your marketing, this is a great way to get feedback. Retailers, restaurant owners, designers and even manufacturers can ask their customers what products they would like to see on offer. With the information you get from the Instagram polls, you can make an informed decision as to how to stock your inventory or what to have on your menu. The possibilities are endless. And best of all, it is free. Once you take the image or video, create the poll, and share it with your followers, they can start voting. Each vote is posted in real-time, so everyone can see who or what is winning or losing. But the data is even more granular than that. You will be able to see how many votes each option of your poll received, as well as who voted for what option. With this information, you can decide on whether you should go with one product or another. And if it is close, you might consider having both of them available for your customers. The content in Instagram Stories disappears in 24 hours, and the same goes for polls. So the polls you create have to take the time constraint into consideration. But it doesn’t detract from the value you will gain with the data. Not long ago, this type of marketing was only reserved for very large enterprises. As a small business, you will now be able to create Instagram polls quickly and get results in 24 hours. Take advantage of the opportunities this new feature provides and engage with your customers. In addition to Polls, two new features will let you tap your creative side with a color picker for text and brushes, and an alignment tool for text and stickers. You will be able to choose a color to apply on your images or video when you add text or draw something. If you use Apple iOS, you will get guides for centering and aligning text or stickers too.